Replacement cartridges for 4.5 x 10 inch whole house water filters. The product range covers all filter types including sediment, carbon block, GAC, KDF and Active Ceramic filter cartridges. 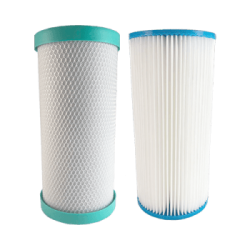 Keep your whole house water filter working effectively by ensuring regular timely filter replacement.